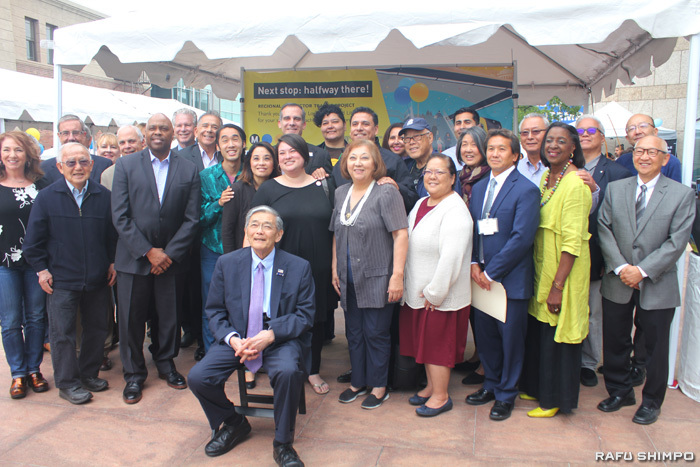 City, Metro and community leaders gathered at the Regional Connector celebration, including former U.S. Secretary of Transportation Norman Mineta (front) and Mayor Eric Garcetti (back, center). TaikoProject was among the groups that provided entertainment. Acknowledging “bumps along the way,” Los Angeles Mayor Eric Garcetti thanked the Little Tokyo community for the patience shown by stakeholders as construction of the Regional Connector reached its halfway point on May 19. 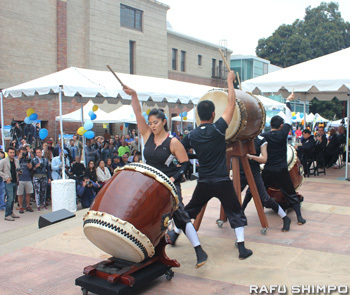 The milestone was celebrated in the Japanese American National Museum’s plaza, across the street from the construction site on First Street between Alameda and Central, which has entailed many street closures over the years, impacting local businesses. 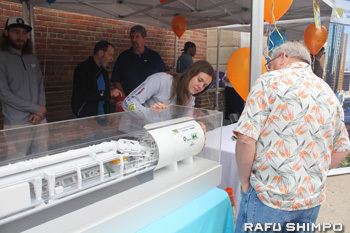 The Metro booth had a model explaining the tunnel-building process. Speakers included former U.S. Secretary of Transportation Norman Mineta, who is also chair of the JANM Board of Trustees; Metro CEO Phillip Washington; Metro Board member Jackie Dupont-Walker; and Dave Thompson, general manager at Bank of America Plaza for Brookfield Office Properties. Mineta said that the Regional Connector will contribute to the economic development of Little Tokyo — which he described as a center for not only Japanese Americans but also the larger Asian Pacific Islander community — and provide an environment in which young people can start businesses and grow as leaders. 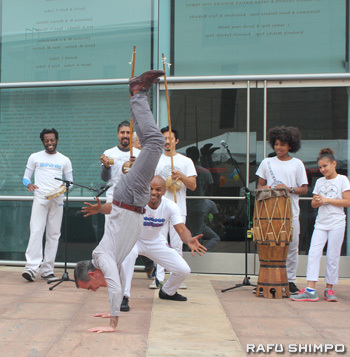 Mayor Garcetti showed off some moves as he joined in the capoeira performance. The program included songs by Ukes for Little Tokyo, a senior ukulele band led by Chester Ikei; drumming by TaikoProject; ukulele music by Jason Arimoto from U-Space; an Afro-Brazilian capoeira martial arts demonstration (with the mayor joining in); games and face-painting for kids; and a miniature-golf hole created by artists Dan Kwong and Chris Tashima. Treats were provided by local businesses, including Fugetsu-Do and Café Dulce. The event also featured a raffle for bicycles and Metro TAP cards, silent disco yoga led by JQ Williams of Bender Yoga, a DJ, and workshops led by Metro-commissioned artists Audrey Chan and Pearl C. Hsiung. Metro anticipates 17,000 new riders when the Regional Connector becomes operational in 2021.The 1.9-mile underground transit project will eventually connect the Metro Blue, Expo and Gold Lines with a station at First Street and Central Avenue in Little Tokyo. 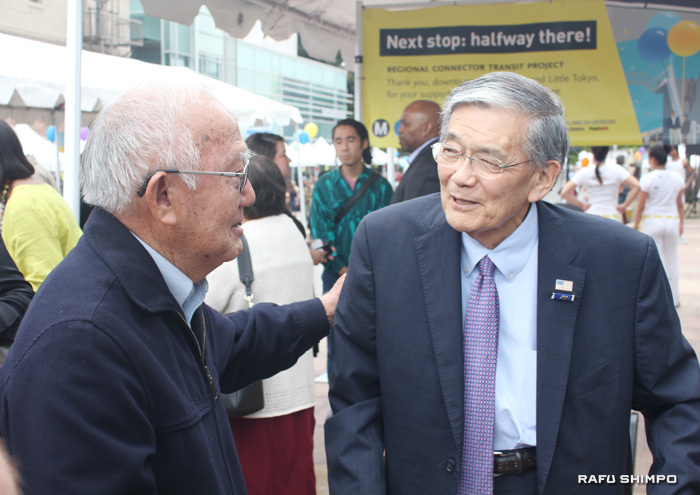 Yukio Kawaratani of the Little Tokyo Community Council Transportation Committee chats with Secretary Mineta. Two other stations are planned at Second Street/Broadway and Second Street/Hope. Metro’s mitigation programs — Business Solution Center, Business Interruption Funds, and Eat, Shop, Play — are helping to alleviate problems that the construction has caused for community-based businesses. L.A.’s commuter rail system is a great disappointment given that, Whittier and many other cities, to the south-east, have no stations closer than Norwalk, or East L.A. Construction is, in my opinion, glacialy slow, bogged down by ridiculous environmental niggling and petty municipal whining. I, and many other TAX PAYERS, want something TANGIBLE, not bureaucratic drivel.